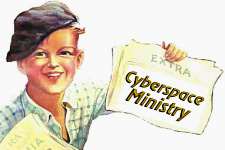 Cyberspace Ministry - What’s New? Cyberspace Ministry’s news are classified in reverse chronological order (the most recent first). Last update: January 1st, 2018. Some of you have recently asked why there have been no new wallpapers added to our site in the last few months. Due to financial restrictions, we had to concentrate our scarce resources on Bible lessons and spiritual gifts identification. We presently struggle to maintain these services, and more than ever we need your help in order to keep this ministry alive. Your support through a one-time gift or monthly donation enables us to work full-time in the ministry of evangelism, winning precious souls from all over the world for Jesus Christ. For more details, please visit the section Make Your Donation. Thank you for your support. In the last two years (2014-2015), there were not enough donations to cover the operating costs of this ministry. We really need your help in order to continue this ministry. We gladly provide these lessons and services free of charge. No organization, religious or other, finances Cyberspace Ministry. So we have to rely on the generosity of people like you who believe in the importance of this work. If you find this ministry worthwhile and would like to see it continue, please prayerfully consider supporting it. Any freewill offering will help us carry on our mission. For more details, please visit the section Make Your Donation. Thank you for your support! Oswald Chambers (1874-1917) came into a personal relationship with Jesus as his Savior in his teen years. He studied art and archeology at the University of Edinburgh before answering a call from God to the Christian ministry. My Utmost For His Highest, his best-known work, has been continuously in print since 1935 and remains in the top ten titles of the religious book bestseller list with millions of copies in print. Read his thoughtful meditations on our website every day! We have simplified the conditions for taking part in our monthly drawing. This is your chance of winning great Christian books every month! Now all you have to do is visit the Facebook page of Cyberspace Ministry, and «Like» and «Share» the posts of Cyberspace Ministry on Facebook. To do so, simply click the Facebook options «Like» and «Share» below each publication. Every time you «Like» and «Share» a different post of Cyberspace Ministry on Facebook during the current month, you automatically raise your chances of winning the drawing at the end of that month. Accumulate the drawing tickets by clicking the Facebook options «Like» and «Share» below each publication! For more details, please visit the section Monthly Drawing. Good luck! When you successfully complete all the tests of any online Bible course from Cyberspace Ministry (The Moment of Truth, If I Were Told the Future, or The Last Countdown), you receive a nice personalized Certificate of Achievement. Recently, we awarded our 1000th certificate. Congratulations to all our students! If you haven’t done so yet, join our online Bible class, with personal coaching and supervision, and get your very own Certificate of Achievement! Cyberspace Ministry’s analogical Bible reading plan offers an all-new way to read the entire Bible in a year. All the biblical passages have been classified by topic, following the chronology of events reported by the Bible: from the Creation of the Universe to the Inauguration of the New Earth. In order to standardize the allotted time, each daily reading contains a similar number of verses, while staying in harmony with the natural breaks in the biblical narrative. Start this stimulating and innovative Bible reading plan today! To try it is to adopt it! In the daily grind of life we look for answers regarding our health, family, job, financial situation and future. We devote time, energy and resources in pursuing happiness and fulfillment here below. But what about our eternal life? God’s plan of salvation is the path the Lord has created for each one of us to return to Him and inherit eternal life. Understanding this plan is the greatest blessing one can achieve here below. Discover God’s wonderful plan of salvation through 100 fully illustrated Bible verses! If you wish to support Cyberspace Ministry on a regular basis, to make a lasting and ongoing difference in the lives of precious souls who search for the truth, you can now set up a monthly recurring donation by Paypal. It is easy, fast, and safe. For more details, please visit the section Make Your Donation. We thank you so much! Charles Haddon Spurgeon’s many writings and brilliant sermons are still widely published today, testifying to his timeless appeal. His classic Morning and Evening continues to be a popular daily devotional even today. Read his thoughtful meditations on our website twice a day! Each month, brighten up your computer desktop with our new Christian Desktop Wallpaper, featuring an inspirational Bible verse and this month’s calendar! Our monthly desktop wallpaper is available in 6 different sizes. And don’t forget... If you appreciate our free wallpapers, please click the voting buttons below the preview of the wallpaper, helping make Cyberspace Ministry known to others. Thanks so much! After 18 months of intensive work, we are glad to launch Cyberspace Ministry’s new website, thoroughly updated and improved. All the content from the previous website has been transferred, re-worked, and supplemented. At first glance, the new visual elements stand out in particular: a more dynamic design, stronger colors, and more attractive images. However, what appears to be a simple layout facelift is actually based on consistent implementation of users’ suggestions: clearer organisation, simpler navigation, improved readability, and comprehensible language. Our Monthly Drawing is your chance to win great Christian books! Drawing is held on the last day of the month. Multiple entries are allowed, as long as each entry is eligible (see details on Monthly Drawing webpage). Previously monthly but now weekly, our free Bible Wordoku can be solved online on our website, and this fascinating Bible puzzle can also be exported to your website. Each Friday night, a new Wordoku will be issued. Take up the challenge! Don’t miss the Weekly Comic Strip, from Chick Publications. Each one grabs the reader’s attention, then clearly presents the gospel of Christ. Each Friday night, a new comic strip will be issued. Enjoy the reading, and invite your friends to read it too! Our Christian Library has been expanded and carefully renovated. Now, your donation gives access to almost 150 books to choose from. Day after day, our webpage’s right column presents a new Bible Verse, a new Quote, a new Quip, and a new Cartoon, usually linked with a common theme. So, visit Cyberspace Ministry’s website on a daily basis! Cyberspace Ministry is happy to announce the release of the game Quest for God’s Armor. Quest for God’s Armor is an exciting computer game that challenges 1 to 4 players to assemble the six parts of the Armor of God. Players try to build up their armor by successfully answering multiple-choice Bible questions. Up to 6,550 questions are available in 14 different categories. To download this free game, we invite you to visit the section Our Games. A Deluxe version of this game is also available, with more options and special features. For more details, please visit the section Our Games.